Imp is still sick and Duke is in slow recovery from the "Coughing Disease From Hades". Mom prescribed lots of liquids, chicken bone broth, and cuddles with their favorite rat Oreo. 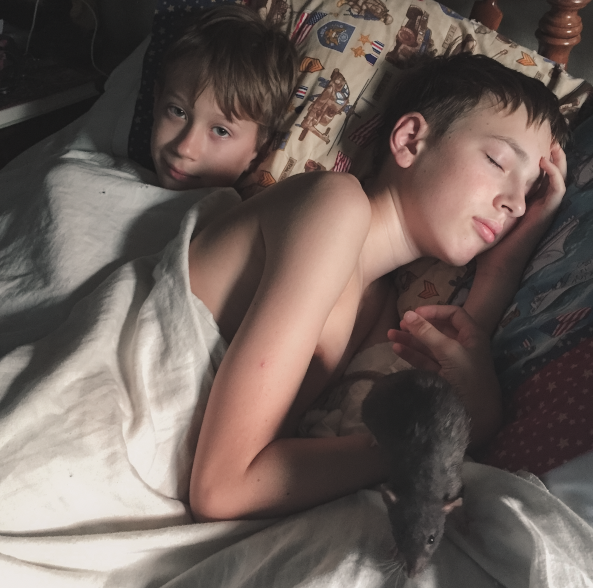 Yes, my kids cuddle with rats. This post contains some Amazon and Graphics Fairy affiliate links. So I have been stuck at home nursing my sick boys for two weeks and counting. I could have cleaned the house and caught up with laundry, but instead I used the time to work on my August tutorial for the Graphic's Fairy site and also I made more soap! Quite a bit of soap in fact. I had made several batches months ago and I didn't want to make any more until I was running low. We really aren't that dirty and don't need that much soap. However, I always make extra for gifts. But finally the soap pile was getting low and I gave myself permission to make more. I purchased the "Pure Soapmaking" book and it really encouraged me to try cold process soap-making. The book is very beautiful and easy to read, and I love the tips for creating pretty swirls and fancy soaps. Some of the examples use specialized soap-making equipment I don't own, but I can modify them quite easily. This book is very inspirational. 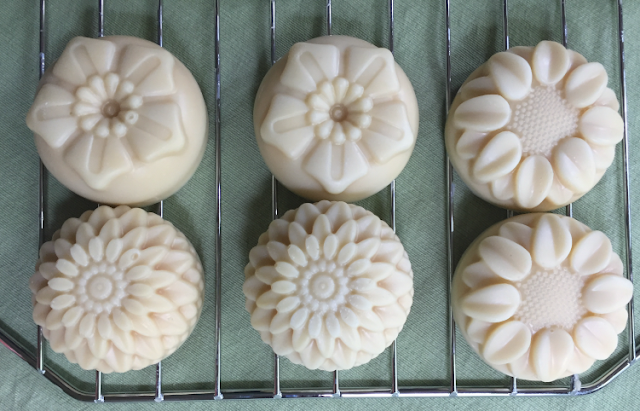 Cold process soap can be prettier than hot process, but it takes weeks to cure. I am impatient so this drives me crazy. But look at these gorgeous flower soaps! I used this flower silicon mold. 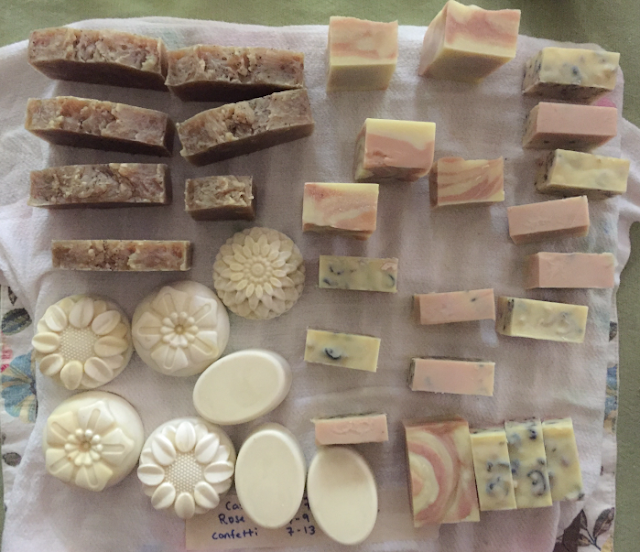 When I started making soap one of my favorite soap-making blogs was The Nerdy Farm Wife. I love that she only uses natural products in her soaps. And she is about to publish a soap-making book called "Simple & Natural Soapmaking". I preordered it just to be able to watch her free video soap-making class. Here is the link to read all about it (I am not a Nerdy Farm Wife affiliate, I just love her stuff!). If you preorder the book (before Aug. 8th) you get the classes for free. I have already watched all of the available ones and they are amazing. The videos and printables contain soap recipes, step-by-step instructions, tips/tricks, etc. 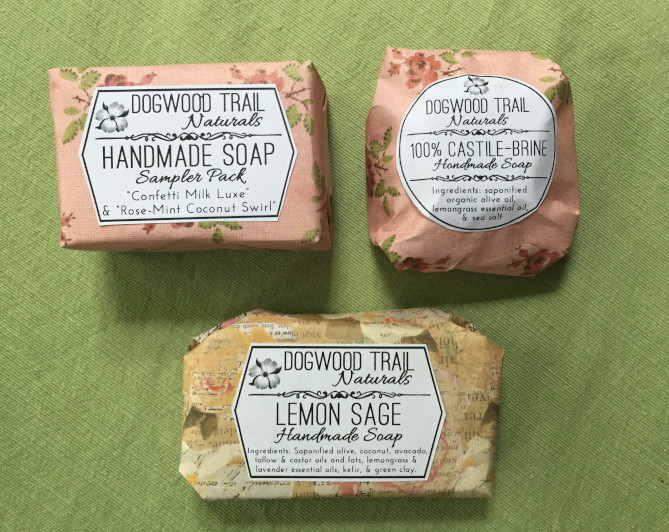 I wish I had watched these before I started making soap, but they are also great for the more experienced soap-maker. I learned so many new things! I also ordered her previous book "101 Easy Homemade Products". I kept on checking it out from the library and decided it was time to give back to The Nerdy Farm Wife. ;-) This book is full of amazing natural products you can make for your body, home, pets, etc. Again, I love that Jan only uses natural products and most of her recipes use inexpensive ingredients. So what to do with all of this new soap? I have to use it/get rid of it so I can make more. Luckily I have friends and family that will take some of it off my hands. I wrapped the soaps in some pretty paper from Hobby Lobby (the 12x12 scrapbooking paper packs, 40% off with coupon!) and then designed my labels in Photoshop. I am cheap and didn't want to buy sticker paper, so I printed them out on printer paper and then cut them out and pasted them on with a glue stick. I think they turned out great!!! I might add some twine or ribbon to really fancy them up. These soaps are for my friend Gina, then I have to make a set for my mother and sisters. By then I will have received my new soap-making book and I can make more soap!!! Yes, I might be a bit addicted. That is great Tina! I love that mold and have two of them. The soap just slips right out. I also use them for lotion bars. Hey Rita! I'm sorry that the boys are still under the weather. Hopefully they'll be back to their old busy selves very soon. Ummm...rats actually cuddle? They sit still long enough to do so? I've seen a pet rat up close before and actually petted one--I think they're cute, except for the tail which I tried to avoid looking at--but I would never have thought of them as cuddlers. Oh and the new soaps are just so pretty. The floral moulds are awesome and your packaging and labels look nice as well. You really should start selling some of your excess. I WISH I could purchase some from you but being so far away from Texas up in northern Ontario, it would be an absolute fortune to pay for the duty. Never mind I'd have to be careful due to allergies to certain products that you use in your homemade soaps. However, maybe there people closer to you that could sell to. Anyway, that is enough rambling for now. Enjoy your weekend! You are so right about then rats being very busy. Females never stop moving until they are seniors, and the males are quite cuddly. We have females because they are more entertaining for the boys. And thank you about the soap! I wish I could send you some. So you can't send gifts to someone in Canda without having to pay a duty tax? I don't know how these things work. "Artist Captures Adorable Rat Portraits To Improve Their Bad Reputation"
French illustrator, photographer, and graphic designer Diane Özdamar has captured these adorable rat portraits to improve their bad reputation. This project is titled; Fancy Rats – A Collection of Domestic Rats Portraits and no rats were harmed during the photo shoots.